The reasons I posted earlier via the 'curious' post I believe still stand, except I also think there is a lack of positive catalysts in the short-term. Anyone of the 4 reasons pretty much acted as an excuse to sell. US economic data matters, but what really matters is global economic data and GLOBAL GDP growth because so many of our companies get their revenue and earnings abroad. With today's decline, the SP500 has been consolidating for 7-8 months. Think about what that means for a second. The market has absorbed 2 strong earning seasons, and has gone no where. The good news, its at relatively strong support at 1250 support. The better news, if it breaks the support, there is super support (yes, I used the word super :) at the 360SMA not too far below. Throughout this decline, I think opportunities have emerged, and I have been using the heavy cash position I have built. The market multiple is not over-extended by any means, especially with two quarters worth of earnings under its belt. 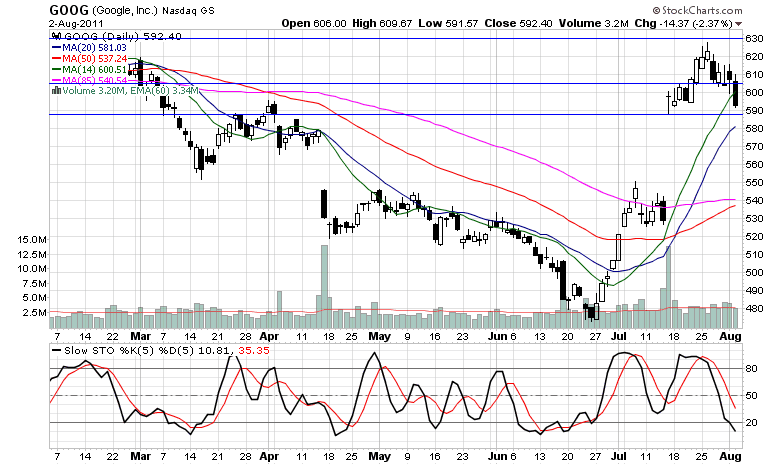 I have purchased DIS, AXP, IBM and AAPL. And am patiently waiting to trade GOOG, POT, ATI, more IBM, AXP and re-adjust the DIS options to my equivalent number but via the Jan 2012 37 strike. 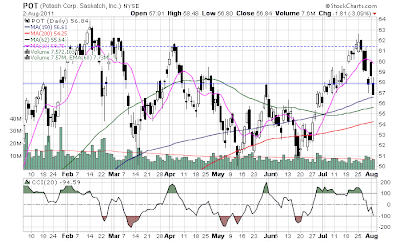 POT - Looks really good here, and almost over sold. Looking for an initial entry, and adding more between 54-55. 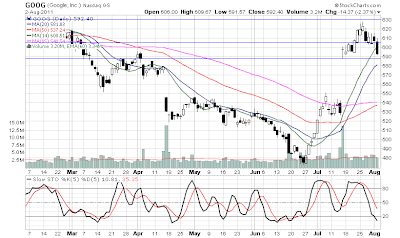 GOOG - I was tempted to day-trade this one off of its daily 14SMA, good thing I didn't :). 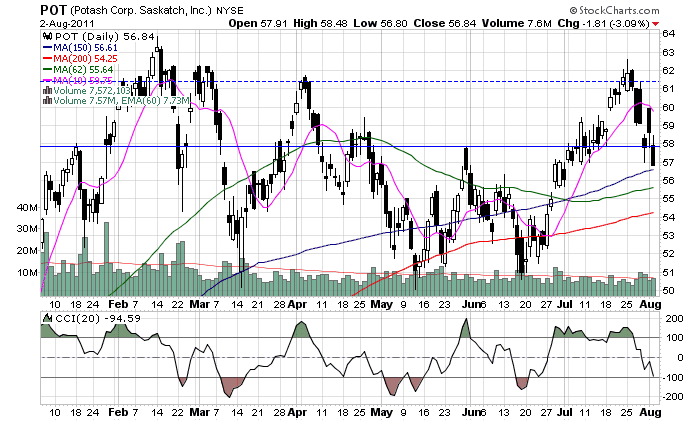 But I will most likely enter near the 20 SMA or high 580s. AXP - Already added a second position at its daily 76SMA, and am looking to add a third position around its weekly 28SMA. Also, its trading with a really low trailing PE. Considering more consumers are saving, their delinquency rates should be declining further. ATI - It saw the decline I was concerned about, and now am tempted to re-enter. I am probably going to wait for the market to hit the 360SMA to play this one. Also, a side note on the FED and QE2. They have made/making a nice gain. The $600B purchase of treasuries started on Nov 12th 2010 and ended June 30 2011. Look at the treasury yield from that time period, while keeping in mind the yield is now near 2.6%. The vast majority of the Fed's purchases were north of 3%. It would be cool if they captured the profits by pushing what they purchased to market.